It was a friendly but hard-fought competition. Ricotta-filled pastry bags in hand, bakers from across the South Bay and up the Peninsula filled hundreds of cannoli shells for the Little Italy San Jose Foundation’s first-ever Cannoli Tournament on May 6. There were nonnas with decades-old recipes, professional bakers, restaurant cooks and catering specialists. The bracket-style competition ensured some very tough rounds. And truth be told, judging cannoli is harder than judging, say, chili. There are simply fewer variables with cannoli: You’ve got your filling and you’ve got your shell. And there are lots of good versions out there. In the end, two Peninsula professional bakeries were left to vie for the title. And both came away winners. 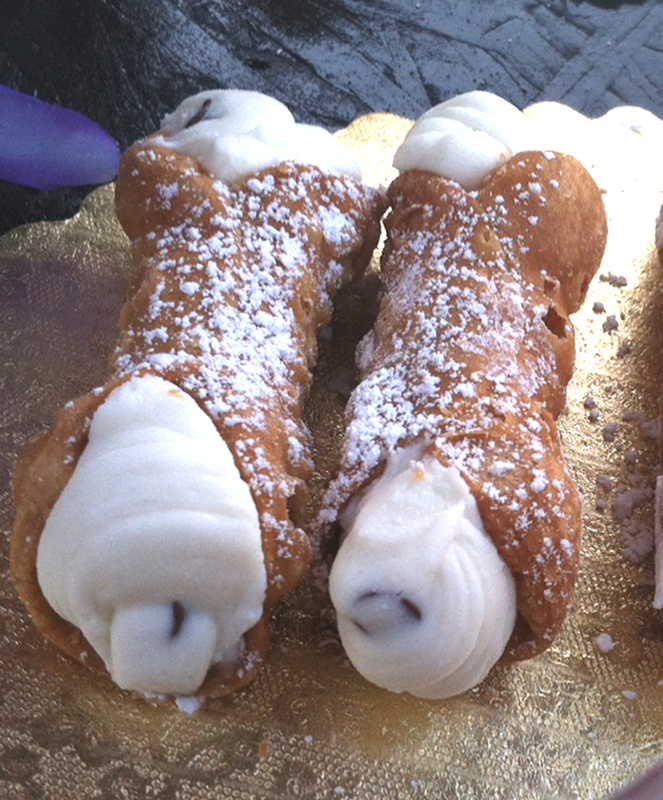 La Biscotteria, of Redwood City, won the judges’ title for best cannoli. Romolo’s Cannoli, of San Mateo, took home the people’s choice title. The other contenders included Dolce Sicilia, a mother-son Sicilian baking company/caterer based in San Jose; Holy Cannoli, a startup baking company, also based in San Jose; The Charming Kitchen, San Jose bakers/caterers who specialize in cannoli parties; the pizzeria restaurant A Slice of New York (San Jose, Sunnyvale); and two longtime home bakers, Mary’s Cannoli (Campbell) and Teresa Cefalu Dirkson Cannoli (San Jose). Bel Bacio, the new Italian coffeehouse and lunch spot in San Jose’s Little Italy neighborhood, hosted the competition. This California city's climate is the best in the country, period. And that's according to the government, so you know it must be true, right? For a sweet taste of Italy in Redwood City don’t miss La Biscotteria, where you’ll drool over traditional Italian classics like panettone, cannoli, and of course incredible biscotti. The charming bakery has been serving these delicacies to the public for 10 years and still gets rave reviews. Make a detour (and some room in your stomach) for these sweets. Delizioso! The Almanac says, "Biscotti, Cannoli, Focaccia ... That's Italian!" La Biscotteria is excited to share the following article featured in the The November 1, 2006 issue of The Almanac in their Food & Drink section. One sniff outside the door at La Biscotteria, and you'll be hooked. Serving handmade pastries and pasta made from authentic Italian recipes, La Biscotteria has perfected the biscotti and more in an unassuming bakery shop in Redwood City on El Camino Real. The classic anise almond biscotti creates a magical combination of flavors and a big crunch, especially the dark chocolate dipped. The lemon version dipped in white chocolate is light and lemony, refreshingly sweet and crunchy, and better than I expected. The pumpkin biscottini with cinnamon spices and brown sugar makes a great holiday flavor with no nuts, and a more simple approach. I liked them best dipped in Peet's French Roast coffee for breakfast. 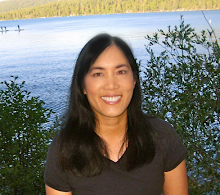 My favorite flavor is the orange dark chocolate dipped, a crazily addictive combination of almond crunch, a burst of orange essential oil, and rich dark chocolate. Wow. I also had to try the pumpkin cannoli made to order. It's like an Italian version of pumpkin pie, with a delightful crisp shell and a creamy pumpkin filling. I can see why it's another classic Italian dessert. I haven't even made it to La Biscotteria's homemade ravioli or focaccia yet, but according to reviews on Yelp, they're all big hits with customers. The cheese ravioli is available year-round while the butternut squash and meat filled ravioli are only available at special times of the year. The focaccia must be ordered by 3 pm on Fridays and is only available for pick-up on Saturdays between 10 am- 3 pm. I have a feeling their loyal customers don't mind going through these hoops to get their favorite focaccia, especially the artichoke and pesto version, which seems to have rabid fans on Yelp. There's much more to try and enjoy at La Biscotteria from the amaretti chocolate dipped cookies to the chocolate chip panettone and hand painted ceramic majolica pottery from Umbria, Italy. I will save those to savor and experience later. Good things come to those who wait and to those who make a stop at La Biscotteria. The February 2005 issue of Fancy Food & Culinary Products magazine highlighted La Biscotteria's biscotti in their monthly column, "What's New? Ask Nancy". La Biscotteria is proud to have garnered the attention of such a prestigious magazine.Fancy Food & Culinary Products is a standout in the gourmet retailing marketplace, writing exclusively for retailers of gourmet food and the culinary products they sell. Visit Fancy Food Magazine at www.FancyFoodMagazine.com. If Nonna isn’t baking, buy these! We love biscotti, but don’t often have time to bake our own. They’re more time-consuming than a drop cookie like chocolate chip. As “twice-baked” cookies, they require an evenly-shaped loaf to be baked and sliced into the individual cookies, which are baked again to achieve their famed crunchiness. 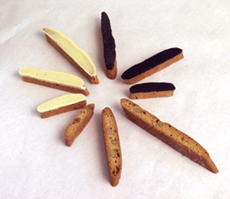 Most of the commercially-available biscotti fall way short of our own in taste and quality, so we have spent long periods in biscotti deprivation. That’s why we were so happy to find La Biscotteria, a San Francisco-area bakery that makes old-fashioned biscotti with some new twists, that we’ll happily substitute for our own. 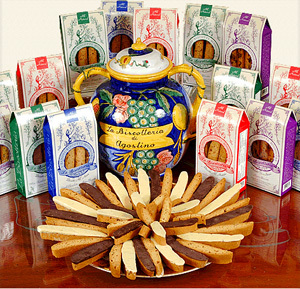 We also that in addition to the standard 5" café-size biscotti, La Biscotteriamakes a 3" biscottini for snacking, coffee, and dessert accents. La Biscotteria uses great recipes—the anise and lemon were brought to America from Naples by the founder’s grandmother—and premium ingredients. All flavors are made with whole California almonds, sweet cream butter, fresh whole eggs, pure cane sugar, pure essential oils and Madagascar vanilla. Schokinag, one of the world’s finest baking chocolates, imported from Germany, is used for the icings. The 3" biscottini are large enough for full enjoyment of the treat, yet small enough so you don’t feel as if you’re over-indulging. They snuggle perfectly against a coffee cup or gelato dish, and slip easily onto an assorted desert plate. The 5" biscotti are available in gift boxes. The biscottini are available in bags only, but you can put them in a decorative tin for serious gift-giving. For a more casual gift, put the biscotti bag in small, festive gift bag with tissue paper and; the recipient will think the packaging is just perfect.